Growing up, one of the staple food items I remember was Hostess Cupcakes. We would get them for road trips, snacks, and just for stocking them up in the freezer. We loved to microwave them and get them all gooey! MMM! I don’t know why but it has probably been 15 years since I last had one. When I saw this recipe it took me back and I had to try this fun take on them! Bake cake as the box directs and let it cool completely. 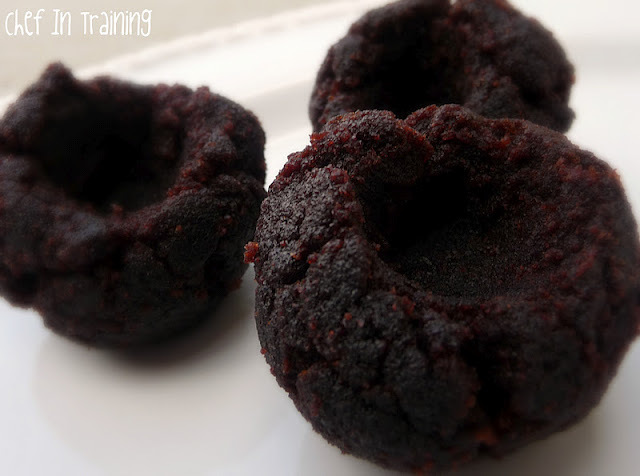 I used Devil’s Food, but any chocolate cake mix will work. Once cooled, crumble with hands. Add 1/2 container of cream cheese cake frosting and mix with hands. Roll the mixture into balls. 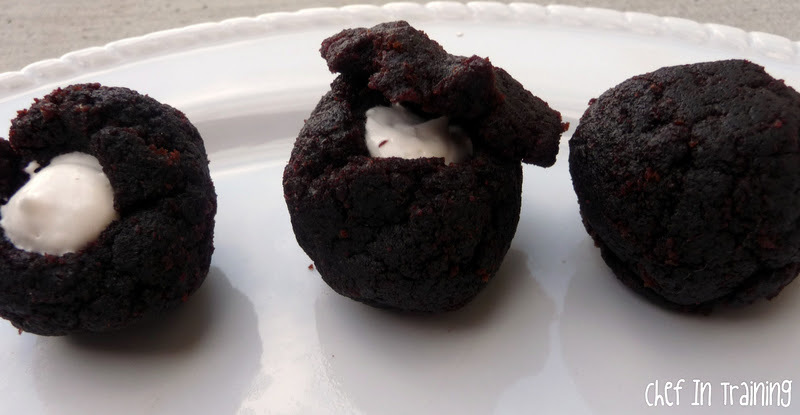 Save some of the mix to cover the hole after filling… just enough to make about 2 cake balls… Do not freeze this part. Just set it aside. Hollow out the inside of each ball with your finger. Once this is done place them in the freezer while you are making the cream filling. Let stay in freezer at least 30 minutes. Dissolve salt into hot water and set aside to cool. Whip marshmallow creme, shortening, sugar and vanilla until fluffy. Add water once cool and whip well. 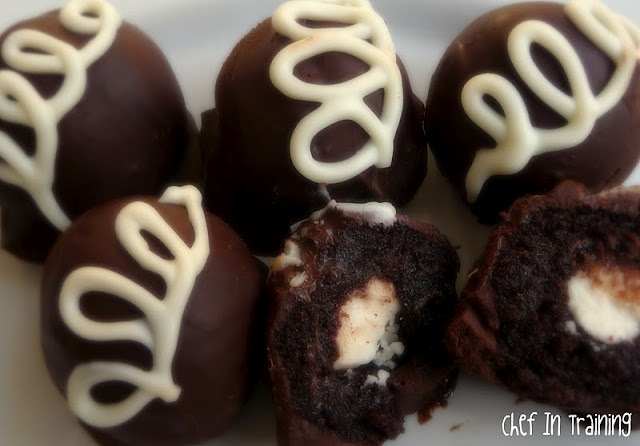 Take the cake balls out of the freezer and fill them! After they are filled, smooth out a piece of the cake ball mix and place over the filling. 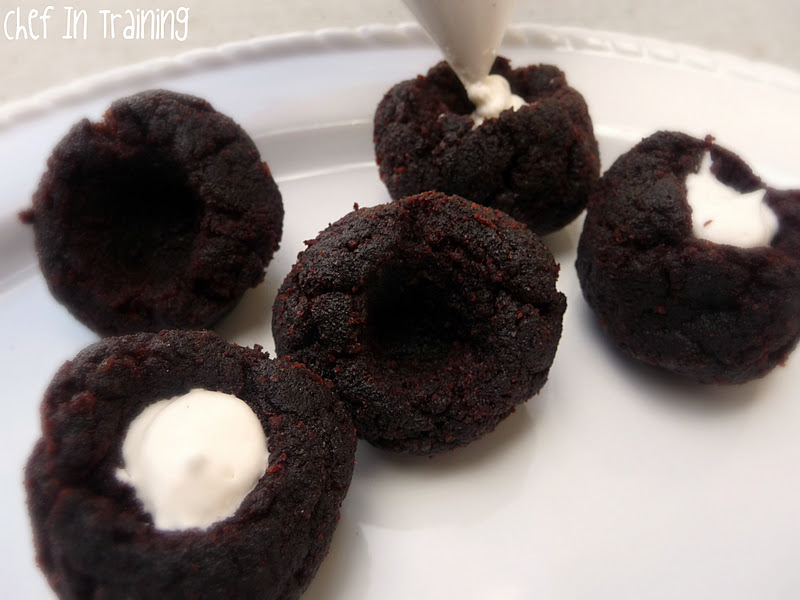 Smooth onto the cake ball to make the rounded ball shape. Put them back in the freezer for about 20 minutes. Once they are ready, melt your chocolate and dip as normal. Put BACK in freezer or refrigerator for just a few minutes while you are preparing the white chocolate. You can use either a Candy Decorating Pen or melt some white chocolate chips and place in a ZipLoc bag… snip just a very very tiny bit off the end then swirl it on. They may not look perfect, but boy are they DELICIOUS! My brothers were big hostess cupcake and devil dog fans (I think that was Drakes), and I loved the sunny doodles! Oh these are wonderful! Fond memories of childhood. Would love you to come link these up at my link party going on right now! Great idea!! They look so delicious!! These look fabulous! Awesome idea! This has got to be the BEST cake ball idea I have EVER seen! I am so making these this week! Well, don't these look yummy? I'm just going to have to give these a try! Man, these look good! I'm pinning this recipe! Thanks! Yum! These look amazing! If it wasn't 10:30 at night I would make these right now! Of course, Walmart is still open. Very tempting! I found you through Tatertots and Jello. Thanks for sharing! These look amazing! Pinning this for sure haha! Fan of Sugar Derby and now a fan of yours! Love the Hostess pops! Yumm-o! Oh my yumminess! I am pinning these yum! Oh yum. I want these too!!! These are so cute, and look yummy! I really didn't need to see these! Now I want to make them...like right now! And that means I will be eating way too many of them! Stopping by from TT&J! Wanted to let you know I featured this as part of my Open House Link Party Wrap Up! Feel free to grab a featured button from my sidebar if you like! Ah! So yum!! All of your yummies look so good! How much melted chocolate is needed to coat? Did you use melted chocolate chips or almond bark? The chocolate wasn't really described and I find these seriously tempting! Is it ok to freeze the cupcake balls after they are completely finished? Just for a few days?